ON THE BLOCKCHAIN - Toward a New Era in Precision Medicine. Most global healthcare systems are broken. Healthcare provision must change and insurers, healthcare providers, governments, pharmaceutical companies, and patient support groups, must be prepared to respond and lead. We can use innovative, transformational technology to build a new and improved precision health ecosystem, combining accurate diagnosis and rule-based therapies. One of these is blockchain. 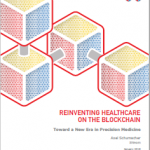 2017 A. Schumacher (2017) Blockchain & Healthcare. 2017 Strategy Guide for the Pharmaceutical Industry, Insurers & Healthcare Providers. The healthcare industry needs a revolution – and it is here now. Trusted and open R&D processes, auditable & secure transactions between parties, authenticated by mass collaboration and powered by collective self-interest, rather than by fewer and fewer pharmaceutical giants motivated by profit alone. This healthcare ecosystem is immune to exorbitant drug prices, tampering, fraud, or political control. The name of the technology that makes all this happen is blockchain, a tool that will fundamentally change the healthcare sector. Blockchain will prove to be indispensable in building a global precision-medicine ecosystem that optimally connects patients, clinicians, researchers, insurers and clinical laboratories to one another. Blockchain will improve data security, data sharing, interoperability, patient engagement, big data analytics, health information exchange, fighting counterfeit drugs, R&D processes, AI-based diagnostics and fostering vertical business models. Compared to the financial markets, the healthcare industry’s participation with the technology remains in its infancy – but this can change now. This strategy guide may direct you in starting this process to transform ideas into profitable and ethical business models. Handbook of Epigenetics: The New Molecular and Medical Genetics, Second Edition, provides a comprehensive analysis of epigenetics, from basic biology, to clinical application. Epigenetics is considered by many to be the new genetics in that many biological phenomena are controlled, not through gene mutations, but rather through reversible and heritable epigenetic processes. These epigenetic processes range from DNA methylation to prions. The biological processes impacted by epigenetics are vast and encompass effects in lower organisms and humans that include tissue and organ regeneration, X-chromosome inactivation, stem cell differentiation, genomic imprinting, and aging. 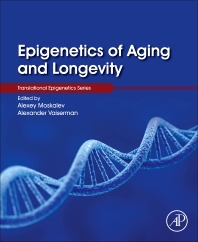 Epigenetics of Aging and Longevity provides an in-depth analysis of the epigenetic nature of aging and the role of epigenetic factors in mediating the link between early-life experiences and life-course health and aging. Chapters from leading international contributors explore the effect of adverse conditions in early-life that may result in disrupted epigenetic pathways, as well as the potential to correct these disrupted pathways via targeted therapeutic interventions. Intergenerational epigenetic inheritance, epigenetic drug discovery, and the role of epigenetic mechanisms in regulating specific age-associated illnesses—including cancer and cardiovascular, metabolic, and neurodegenerative diseases—are explored in detail. Note: The presented method addresses the problems of cell heterogeneity in epigenetics research; avoiding complicated microfluidic systems and offers the opportunity for high-throughput screening in a clinical/diagnostics laboratory, as many single cells can be screened in parallel. Schumacher, Syed Bihaqi & Nasser H. Zawia (2011). Epigenetics and late-onset Alzheimerâs Disease. Epigenetic aspects of chronic disease. Springer. 2010 Schumacher (2010) Aging Epigenetics. 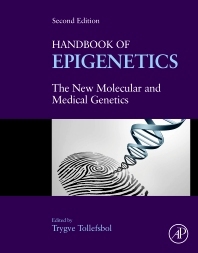 Handbook of Epigenetics: The New Molecular and Medical Genetics. Elsevier. Note: A new unifying model of aging and the development of complex diseases was proposed, incorporating classical aging theories. Schumacher (2010) Nutrition, epigenetic drift and the emerging epigenetic paradigm: Lessons from neurobehavioral disorders. Nutrition, Epigenetics Mechanisms & Human Disease. Taylor & Francis. Note : Worldwide the first proof of whole genome epigenetic abnormalities in late-onset Alzheimer's disease. Featured in many newspaper articles around the globe. Paper has been selected by the Alzheimer Research Foundation as an "ARF Recommends" paper. Selected by the Faculty of 1000 Medicine as landmark must read paper. J. Mill, T. Tang, Z. Kaminsky, T. Khare, S. Yazdanpanah, L. Bouchard, P. Jia, A. Assadzadeh, J. Flanagan, A. Schumacher, S.-C. Wang & A. Petronis (2008). Epigenomic Profiling Reveals DNA Methylation Changes Associated with Major Psychosis. Am J Hum Genet; Mar; 82(3): 696-711. (IF: 12.63). Note: Cover story, which was featured in many newspaper articles around the globe. This was the worldwide the first proof of whole genome epigenetic changes in schizophrenia and bipolar disorder. Paper has been selected by the NARSAD Schizophrenia Research Forum as "Recommended" paper. Schumacher, A. Weinhäusl & A. Petronis (2008). Design and application of microarrays in DNA methylation profiling. Methods Mol Biol. 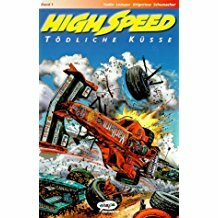 439: 109-29. Schumacher (2007) Online tutorial: Schumacher's Guide #1: Bisulfite conversion of DNA for methylation fine-mapping. Schumacher (2007) Online tutorial: Schumacher's Guide #2: Design and application of microarrays for identifying of DNA methylation. 2006 Schumacher, P. Friedrich, et al. (2006). No association of chromatin-modifying protein 2B with sporadic frontotemporal dementia. Neurobiology of Aging, Sept 14; (IF: 5.60). Note : First introduction of 'epigenetic' SNPs. J. Flanagan, V. Popendikyte, N. Pozdniakovaite, M. Sobolev, A. Assadzadeh, A. Schumacher, M. Zangeneh, L. Lau, C. Virtanen, S-C. Wang & A. Petronis (2006). Intra- and Inter- Individual Epigenetic Variation in Human Germ Cells. American Journal of Human Genetics; 79: 67-84 (IF: 12.63). Note: A Nature Reviews Genetics Research Highlight for 2006! Note: On NAR top hot papers list 2006. Highly cited, cover story of this issue. Described technology was patented and licensed to Pharma-Company. 2001 Schumacher (2001). Mechanisms and brain specific consequences of genomic imprinting in Prader-Willi and Angelman syndrome. Gene Funct. Dis., 2: No.1, 1-19.